UKAM Industrial Superhard Tools is a LEADER in Slicing, Dicing, & Drilling. Manufacturing precision Sintered (metal bonded), Hybrid Bond, and Electroplated diamond tools for a large variety of applications, materials, and industries. Most of our standard stock (inventory) items, can be purchased online/over the internet (on our web site). Non stock items or custom manufactured products will be quoted to you. Contact UKAM Industrial Superhard Tools Sales or Engineering Department. Call: (661) 257-2288 Phone Orders are Accepted Monday through Friday 8:00 a.m. to 5:30 p.m.
Fax: (661) 257-3833, available 24 hours a day. please include product item number, description, and payment. Place your order right here at our web site - 24 hours a day, 7 days a week (any time, day or night!) Ordering Online on our web site is Fast, Easy, & Secure. 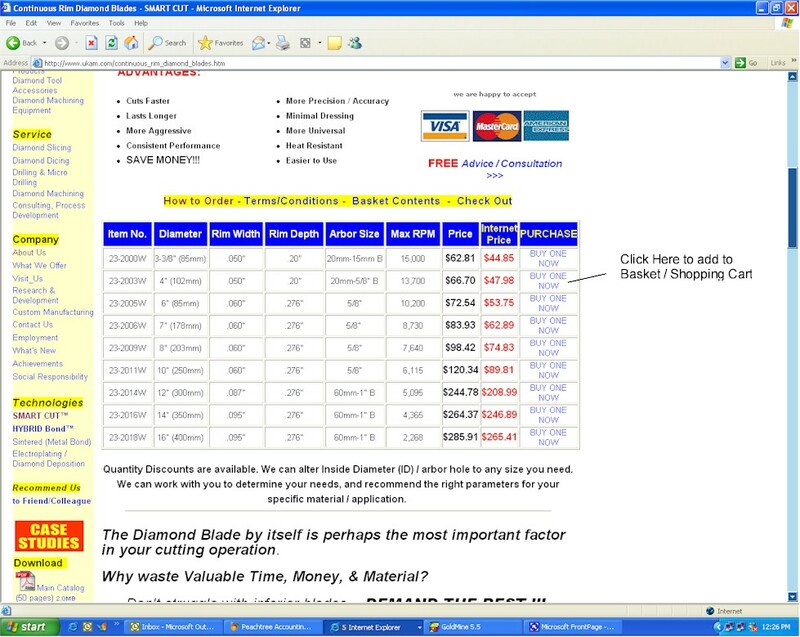 Browse our web site and add the items you want to your virtual shopping cart. Standard stock items that can be purchased through our web site have Add to Basket or BUY ONE NOW Button or Link next to the item. Select the desired items you wish to purchase by adding them to your Online Shopping Cart. When you have completed your purchases. Click on CHECK OUT and proceed to fill out the order form. When you have finished click on Submit! If an item does not have an an Add to Basket or BUY ONE NOW button or link, or Price is not Listed on our web site. Than this item not available for purchase online. To order this item please contact us by Phone, Fax, or e-mail. By Default our shopping cart uses UPS (United Parcel Service) to deliver all internet orders. Our shopping cart will automatically calculate shipping cost. Shipping rates are determined by the total package weight and will be provided to you real-time during the checkout process. All UPS shipping options are available such as: UPS Ground, UPS 3 Day Select, UPS Second Day Air, and UPS Next Day Air A.M. service. Shipping costs are based on product weight, dimensions, and your shipping to address. Other Shipping Methods are available upon request such as: Federal Express, US Priority / Air Mail, DHL, TNT, and many others. If you would like your order shipped by different carrier than UPS, than please place your order either by Phone, Fax, or Mail. All products are shipped from our facility in Valencia, CA USA (Greater Los Angeles County). 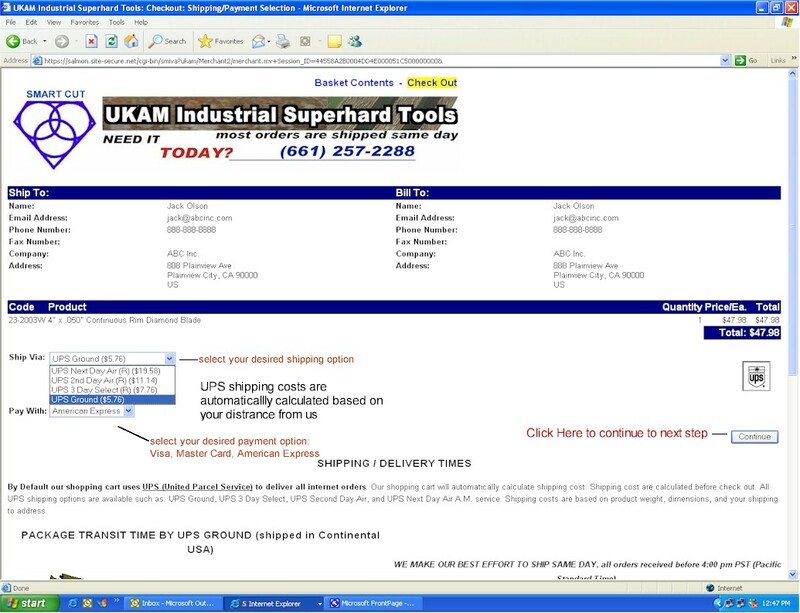 Ordering online from UKAM Industrial Superhard Tools is always secure. All personal details and credit card information is securely encrypted and transferred through our SSL secure server. This encrypts all your payment information, including the credit card information, so that is cannot be read as the information travels over the Internet. Your credit card information is never kept on file and will be immediately destroyed when the transaction is completed (for extra security). You are more secure ordering with a credit card online than giving your credit card to a waiter in a restaurant or scanning it in a store. Once your order is completed you will receive an automatic confirmation (invoice) by e-mail. Showing in detail item number, description, quantity of products purchased, shipping method, freight cost, and total order amount. Please keep this receipt for your records and refer to the Receipt Number provided on this e-mail confirmation for all your future inquiries to us. As soon as your order ships, you will receive a tracking number via e-mail. You can also obtain the tracking number for your order by visiting the Order Status section of our site. We accept Visa, Mastercard, and American Express. If you're ordering by mail, you can also pay by check, money order, or wire transfer. We are now also happy to accept PayPal payments. PayPal is not integrated with our online shopping cart. You can also pay with cash for walk in purchases in our facility in Valencia, CA USA. All payments must be made with U.S. funds (US Dollars). Returned checks are subject to a $20 fee. Purchasing the Products you need is now easier with a low monthly payments. Financing available from outside lending agency, for orders above $1,000 USD. Low monthly payment program for 12 or 36 months. Subject to credit approval. Contact our representative for more information. Guarantee: The quality of our products are 100% guaranteed. UKAM Industrial Superhard Tools is happy to Accept International Orders. Over the past 15 years we have shipped to almost all countries and have customers around the world. Our standard international shipping method is UPS or US Air Mail. Other shipping companies or customers preferred carrier or shipping broker can also be used upon customer request. Credit Card Orders are only accepted from North American, European Union, and few Asian Pacific Rim Countries such as Singapore, Hong Kong, & Japan. Payment by wire transfer is requested from customers in other countries. 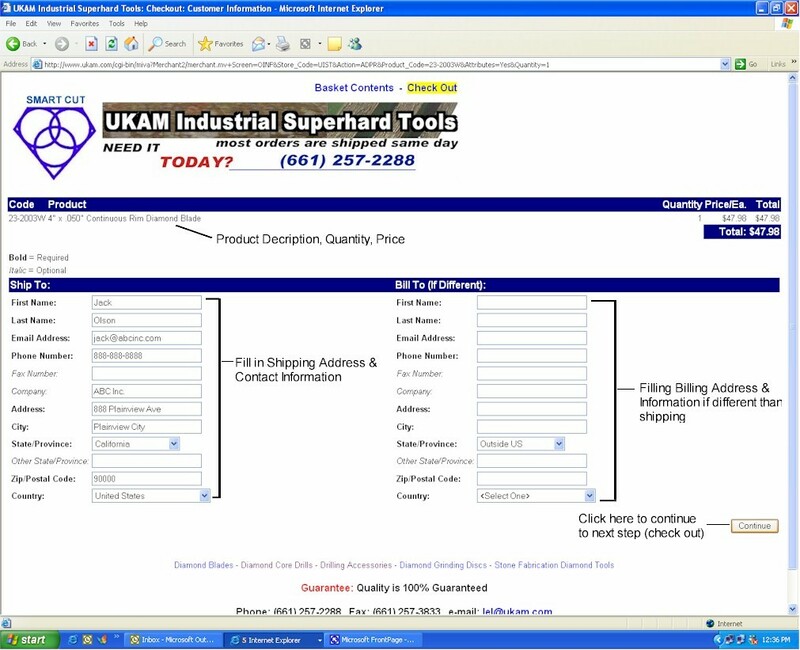 Mail, fax, or e-mail orders to UKAM Industrial Superhard Tools. A confirmation of receipt will be forwarded to buyer immediately. If a confirmation of receipt is not received, buyer should resubmit the purchase order to UKAM Industrial Superhard Tools in order to insure processing of the order. 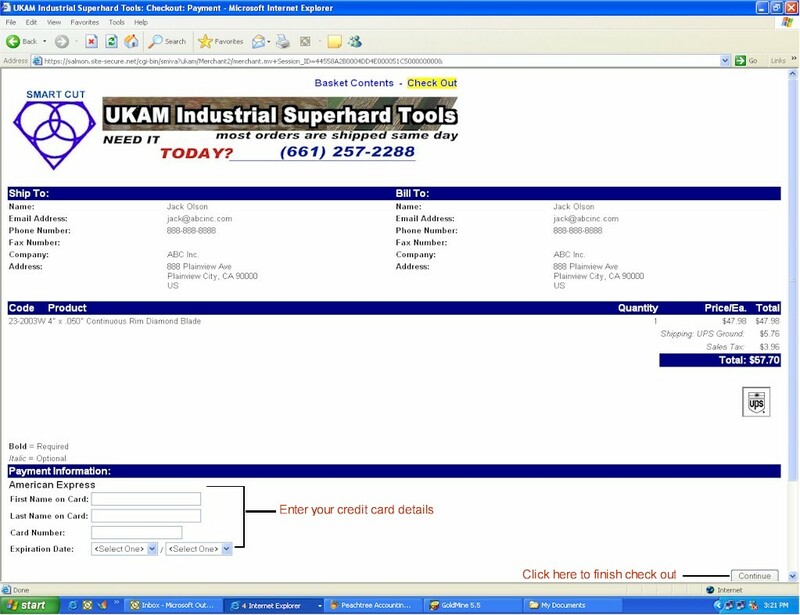 UKAM Industrial Superhard Tools will calculate and fax or e-mail the subtotal of the merchandise and comparison shipping charges when the order is prepared to be shipped. Buyer should then choose the preferred means of shipping, add shipping costs to the subtotal of estimate and notify UKAM Industrial Superhard Tools by phone, fax, or e-mail, regarding preferred shipping and chosen method of payment. WE MAKE OUR BEST EFFORT TO SHIP SAME DAY, all orders received before 4:00 pm PST (Pacific Standard Time). Orders received on holidays or weekends ship out on the next business day. If there is any problem or question on an order, we will contact you as soon as possible by e-mail or phone. Below is a map of Estimated Delivery Days. UPS does not deliver on weekends or holidays. For most in stock items you can receive next day. Alaska and Hawaii Customers: The only shipping method we offer is air service. (UPS 2nd Day and Next Day Air) if Purchasing Online. US Priority Mail Service can be requested if ordering by Phone, Fax, e-mail, or regular Mail. All packages are insured. Please inspect your packages carefully upon receipt. Claims for damages must be filed with the carrier. We will be glad to assist in any way possible in the event of a damaged package. Refusal to accept delivery of a freight shipment will incur the cost of shipping in both directions, as well as a 25% re-stocking fee. From time to time, we offer special promotions and coupon codes. Coupon codes may not be applicable to certain products. If you receive a coupon code, you must enter it when prompted before submitting your order. Limit one coupon code per order. Coupon codes are not accepted for phone orders. Once your order is completed you will receive an order number, as well as an automatic confirmation (invoice) by e-mail. Showing in detail the item number, description, quantity of products purchased, shipping method, freight cost, and total order amount. Please keep this receipt for your records and refer to the Receipt Number provided on this e-mail confirmation for all your future inquiries to us.